Owls usually have nocturnal habits. 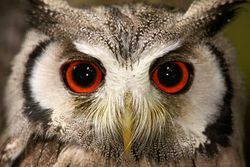 Nocturnal animals in general have highly developed senses of hearing and smell, and specially adapted eyesight. One of the most notable feature of some nocturnal animals is the size of their eyes. They tend to have proportionally bigger eyes than other animals. Some nocturnal animals have more rods than other animals. Nocturnality is an animal behavior characterized by activity during the night and sleeping during the day. Nocturnality can be considered as an ecological niche differentiation. Some animals have nocturnal habits to protect themselves from the intense heat, as is the case for many small mammals that inhabit deserts. 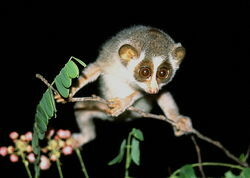 The gray slender loris, like other lorises, is nocturnal and emerge out of their roost cavities only at dusk. ↑ Hickman Jr., Cleveland P.; Roberts, Larry S.; Keen, Susan L.; Larson, Allan; l'Anson, Helen; Eisenhour, David J (2008). Integrated Principles of Zoology (14th ed.). Boston: McGraw-Hill. p. 681. ISBN 978-0-07-297004-3. This page was last modified on 28 August 2013, at 15:33.